Looking for tips for grilled chicken? If you're looking for tips for grilling chicken, it must mean you're firing up the barbecue for dinner. Why not throw some chicken breasts and vegetables on the grill and have a perfectly cooked smoky meal? Yes, that's right - you can even grill the whole chicken. Recipes such as beer can chicken are perfect for the grill, since the bird will stay nice and tender, even under the direct heat of your barbecue. Perhaps one of the best tips for grilling chicken is to get a meat thermometer. They range in price from $10 all the way up to $100, though a good low to mid-range thermometer will probably suit you best. The key is to get a model with a metal probe that can stay in the chicken while it's on the grill. Some models even have a wire that goes from the chicken to a digital display, which is then left outside the grill. This will allow you to check the temperature of your chicken without opening the lid, which is a big no-no when it comes to grilling. With some thermometers, you can even set an alarm that will beep when the chicken reaches the correct temperature. The reason this is so useful is that every time you open your grill, heat escapes and this substantially increases your cooking time. Often a bird that would only take 30 minutes to cook will take over an hour because of constant poking and prodding from an unwitting cook. If you are familiar with cooking chicken on the grill and know how long to cook the individual parts, then you probably won't need a thermometer. But if you're not at that point yet, a $30 thermometer will save you a lot of heartache when it comes to over or under-cooked dinners! Chicken that has been marinated in a flavor solution will most likely come out more tender than chicken that has not been marinated. "Brining" a chicken, or soaking it in a saltwater solution, is a great way to keep it tender. If you create a marinade that has a good amount of salt in it and let it soak into the chicken overnight, your chicken will have a much better texture than if you hadn't flavored it at all. Do you remember that knobby hammer-looking thing that your parents always had around the kitchen? That was a meat tenderizer. By pounding the meat with the pointy mallet before marinating and cooking, it helps to break up the fibers of the meat. This in turn helps the meat to be more supple and soft, since the long, stiff fibers have been pounded into submission. Some parts of the chicken have different thicknesses, and this lends itself to uneven cooking. 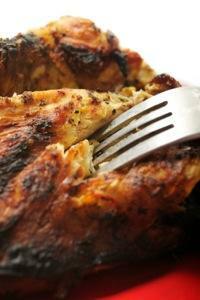 Think about a bone-in chicken breast, which has a very thick part and a thinner part along the ribcage. Clearly, these two parts of the breast will take two different times to cook, as the thin part will cook faster than the thick part. What can you do about this? A good tip is to cut your piece of chicken into two pieces, so that you can remove the thinner part from the heat once it's done, allowing the thicker piece of meat to stay on the grill for a little longer. Experiment with your barbecue and see what you come up with as the best plan of attack for grilling your chicken. With a little experience, you'll be grilling up perfect chicken every time, without any need to search for tutorials!